Relationships must be worked on all the time, not only when they are broken and need to be fixed. Every fairy tale, it seems, ends with the same predictable phrase, “happily ever after.” And yet every amazing couple I have ever known agrees that nothing about a healthy, long-term relationship is forever happy. There are moments of bliss, no doubt, and lengthy spans of fun-loving companionship. Yet these good times come at no small effort, and the guy or girl who reads such fiction and dreams his or her troubles will end when he or she departs the altar is well advised to seek at once a reality check from a real, rational couple who has stayed together through thick and thin. And that’s exactly what I did a couple decades ago. When Angel and I were first falling in love, I went to my parents for some relationship advice. Their advice gave me some much-needed perspective at the time, but what really made a difference was the family ritual born that day. Every year since, I’ve pestered my parents (they love it) on their wedding anniversary and asked them for a relationship tip or two, and I’ve recorded their advice in my journal. Today, on my parent’s 40th wedding anniversary, I want to share a cleaned-up, copyedited version of my parent’s relationship tips. These are the little things they do – the rituals – that have helped their relationship last 40 years and counting. Embrace each other’s flaws. – New couples always fall in love with the most perfect aspects of each other. Who wouldn’t? It’s easy; anyone can love the most wonderful parts of another person. But that’s not what works in the long run. What works is this: Accepting each other’s flaws. Looking at your partner’s faults, and honestly saying, “I can work around this. I can support them and make the best of it.” Because the truth is, good qualities are always going to be there, and they’re always going to be pretty and handsome and wonderful, but the small bits of hidden ugliness underneath can ruin you if you don’t embrace it. Give them a chance, and another, and another. – To say that one waits a lifetime for his or her soul mate to come around is a bit of a paradox. People eventually get sick of waiting. You have to take a chance on someone special, and by the art of commitment you become soul mates, which takes a lifetime of second chances and compromises to perfect. Expect there to be some bumps in the road. – When we face pain in relationships our first response is often to sever bonds rather than to maintain commitment. Don’t do this to each other. The course of true love may never run smooth, but it will always be worth the ride. Don’t let others decide what is right for your relationship. – One of the biggest mistakes is believing there is one right way to listen, to talk, to have a conversation, or to have a relationship. Give up control. – A relationship is twice as complicated when one person is running it. True love is about giving up control. It’s surrendering the desire to control the other person. Loving someone and having controlling power over them are mutually exclusive circumstances. If we are serious about loving someone, we have to surrender all the desires within us to dominate the relationship. Be willing to be wrong. – Sometimes we choose to be wrong, not because we really are wrong, but because we value our relationship more than our pride. Make peace with each other as often as necessary. – Again, most of the time being peaceful and compassionate is far better than being right. Even if forgiveness doesn’t perfectly equate to reconciliation, lay down the sword and let it be. Life is short. Forgive each other. – True love is an act of endless forgiveness – a tender look that gradually becomes a ritual. And remember, forgiveness doesn’t always look attractive until we get to the other side. Be patient with each other. – Patience gives your partner permission to be human. It’s an understanding that everyone fails. When a mistake is made, it’s choosing to give them the time they deserve to correct it. It gives you the ability to hold on during the tough times in your relationship rather than bailing out under the first sense of pressure. Build trust, and exercise your trust in each other. – Every couple has ups and downs, every couple argues sometimes, and that’s just the thing – you’re a couple, and couples can’t function without trust. Pay attention to the little moments. – Truth be told, when you really miss someone, you miss the little moments the most, like just laughing together. Compliment each other whenever it’s deserved. – Do not miss a chance – not one single, tiny opportunity – to tell someone you love how wonderful they are and how beautiful they are, inside and out. Give more than you take. – When you shift your attitude from “how can I gain” to “how can I give,” you’ll be amazed at the gifts you receive from each other. In a way, when you give each other everything, it magically becomes an even trade; each wins all. Be willing to do more than your part. – You know it’s never 50-50 in a great relationship at any given moment. It’s always 75-25, or 60-40. Someone falls in love first. Someone gives a little more. Someone works very hard to keep things rolling smoothly when times get tough; someone else sails along for the ride for a while. And it flip-flops back and forth, depending on whose soul is stronger at the moment. Encourage each other, through thick and thin. – We have enough critics. Be an encourager. One sincere word of encouragement after failure is worth more than a day of praise after success. Be honest, always. – An honest, loving heart is the beginning of everything that is right in a relationship. Follow through with your promises. – When you make a commitment you build hope. When you keep it you build trust. So don’t just say it, show it. Don’t just promise it, prove it. Work together. – You can’t lose when your biggest fan is your teammate in life…who wants to see you have it all, and is willing to work with you to get it. Talk to each other, not about each other. – Lots of problems in our relationships, and in the world, would disappear if we talked to each other instead of about each other. Open up to each other about personal problems too. – Troubles and flaws are a part of your life. If you try to hide them, you don’t give the person who loves you a chance to love you fully. Remember, our wounds are often the openings into the best and most beautiful part of us. Admit your mistakes. – Mistakes are usually forgivable, if one has the courage to sincerely admit them. Be each other’s listening ear, or shoulder to lean on. – Sometimes we simply need someone who will be there for us. Someone who will sit there and listen. Someone who is genuinely concerned. Be that person for each other when you can. True love isn’t about being there when it’s convenient, it’s about being there when it’s not. Listen closely. – Don’t listen with the intent to reply. Hear what is being said with the intent to understand. Be willing to be silent when silence is needed. – If you can’t understand someone’s silence, you will have a hard time understanding their words when they arise. Keep an open mind. – Couples are still two totally different people with different ideas about the world. Expect differences of opinion. Always open your mind before you open your mouth. Focus on each other’s positive qualities. – Too many relationships fail because we spend more time pointing out each other’s mistakes and not enough time enjoying each other’s company. Accept each other without trying to change each other. – To be fully seen by someone, even at the lowest of moments, and be loved anyhow – this is a human offering that can border on being truly divine. Be respectful and gentle with each other’s feelings. – The most precious possession that will ever come to you in this world is another person’s heart. When it arrives, show only love, kindness and respect. Don’t purposely bring each other down. – Don’t hurt someone you love just because you’re hurting at the moment. Use your words to lift each other up. – Be gentle and kind. Think before you speak. The words you choose can only be forgiven, not forgotten. Make each other laugh. – Hard bodies and conventional sexiness wears thin after awhile. Physical beauty fades. But to be in a long-term relationship with a man or woman who makes you laugh every day, ah, now that is a treat. Do little things daily to show each other you both care. – Go out of your way to show your affection. Knowing that the person you’re thinking of has you on their mind too means a lot. Express your appreciation. – Sometimes people don’t notice and appreciate the things others do for them until they stop doing them. Don’t do this to yourself or your partner. Encourage each other. – Encouragement requires empathy and seeing the universe from your partner’s perspective. We must first learn what is important to our partner. Only then can we give encouragement. With verbal encouragement, we are trying to communicate, “I know. I care. I’m with you. How can I support you?” We are trying to show that we believe in them and in their abilities. We are giving attention, credit and praise. Be there for each other, even when you’re apart. – When you love someone it’s not all about being with them every second; it’s about being there for them when they need you, even when you’re physically apart. Be loyal. – When it comes to relationships, remaining faithful is never an option but a priority. Loyalty is everything. Take care of yourself too. – Being kind to yourself in thoughts, words and actions is as important as being kind to someone you love. Because you can’t give them what you don’t have. In your relationship with your partner, seek the love you deserve, but keep in mind that perfect is the enemy of good. Aim high, but do not aim so high in your relationship expectations that you completely miss the target. What really matters is that your partner will love you, that they will respect you, that they will honor you, that they will be unconditionally true to you, that they will give you the freedom of expression and let you thrive in the exploration and growth of your own gifts. They will never be perfect, but if they are kind and considerate, if they know how to work diligently and help provide for your family, if they are honest and full of goodwill, the chances are you will not go wrong, and that you will be tremendously happy in the long run, even if you have to go through some really tough times too. The key, in any case, is to build rituals (like the ones above) that allow your relationship to adapt and grow through thick and thin. Which of the relationship rituals above resonated with you the most? Which ones do you need to work on? What else would you add to the list? Leave a comment below and share your thoughts. Some of the small bits of relationship advice in this post hit home in a big way. Thank you for keeping me thinking, and keeping my mind straight. After being married for 27 years this year, I can confidently say that the honest communication you mention in your 21st point (and supplementally in your book) is the key in my marriage. If two people are on the same page with a ritual of honest communication, they can get through almost anything together. You don’t have to always agree, but you do have to know where each other stand on various life issues. PS: Happy anniversary to your parents. Val, this is your life to invest. Don’t stay there if you aren’t really wanting to. That will become resentment and victimization. Ugh. Be there when you want to but fill your life with passion and fun when you’re not, as well. It’s not all or nothing. Good luck to you. Val, you have to build balance into your care-giving. In other words, care for your boyfriend AND care for yourself too. You can do both. Love your sentiment, as always, Dev. Thank you. Excellent tips. You have wise parents, and a great way of portraying their wisdom. I would say that #30 has been crucial in my 20 year marriage. Make sure you both support each others’ individuality as well. I don’t want my husband to give up hunting (something he truly enjoys), just because I would never do it. I also don’t see him spending hours reading and writing, but he supports that I love doing these things. It doesn’t have to be all or nothing. Caring doesn’t have to be giving yourself away. Spend time with him if you want to and fill your life with other passions and people when you’re not with him. If you are there due to obligation, soon you will only feel resentment or victimized. Balance and humor/fun can go a long way. Also, the notion that relationships must be “worked on” continuously seems devoid of the JOY that we experience as we lovingly tend to our marriage. I agree that becoming an independent, fulfilled person allows you to bring much to the relationship. Do continue to grow yourself & develop your passions & skills. That also makes you more interesting to your spouse. Don’t depend on your spouse to meet all your needs. That is too much of a burden. Have friends & encourage your partner to develop deep friendships, too. If you find you are too “needy” & dependent on your spouse, get the help you need to heal yourself to become a fully mature partner. Compliment your spouse in public! Tell your friends about how much you appreciate him/her. Don’t keep score. Who changed the last dirty diaper to who gets to choose the next movie to go see. Don’t keep a tally. Sometimes I have to be the stronger one or have to “give” more in the relationship. At other times he has to take up the slack. What you focus on expands. Focus on his “faults” & those will become more & more prominent. Focus on his wonderful attributes & those will be the filter through which you see him. Don’t make threats or say rash remarks you don’t mean that will hurt your spouse deeply (threaten divorce, for example). Guard against jeopardizing your relationship with safety “rules” you agree upon that will protect your marriage when you are going through a rough spell. For example, my husband decided it would be best to not take his business associates that were female out to business dinners alone, just the two of them. He always took another work colleague or even me so that the conversation wouldn’t veer into emotional disclosures that might lead to an “emotional” affair or more. If we were going through a “down” time in our marriage that extra protection of not giving him the opportunity to deepen a relationship with another woman allowed us to ride through any hurdles without the additional problem of emotional energy being drained away from the marriage. Lastly, talk about your shared hopes, dreams & goals often. Make plans to reach them. Excellent perspective, Suzanne. Thank you. Days and sometimes weeks go by without communication due to anger, how do you deal with this. Funny once anger leaves the home, happiness and love comes back and all is wonderful. Our strength is love and happiness. After 37 years of marriage and most of them great years, you wonder how much one can handle the downs. My fear is can we handle the next down? Thanks to all for these great comments – always good to hear there is lots of good out there to keep couples like us together. 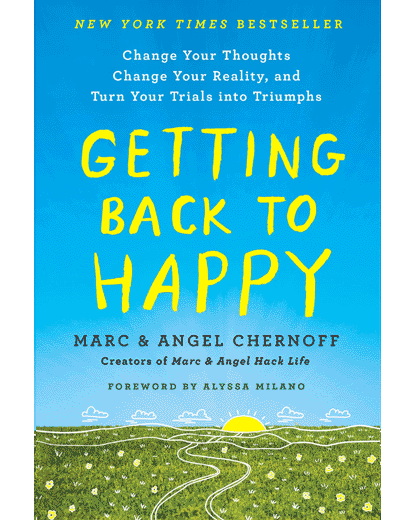 Marc and Angel, it’s been awhile since I left a comment, but I just wanted to say thank you for all the posts you keep sending me via email… I love reading them as they are a gentle reminder of the important and positive ways of living that I often forget. So many of the points in this post rang true for me. Your book is also fantastic in every way, so inspiring and perfect for picking up and putting down when time is short. Wishing you both the absolute best and keep up the amazing work. SO what we needed during this stormy California weekend/week! What great tips to help us remind us what it takes for a marriage to truly thrive. They seem so simple yet with all the chaos that life brings they can often go forgotten. Thank you for the constant inspiration! This is my favorite post yet. Thanks for sharing your parents’ wisdom with us. I love you two so much. I look forward to your next post every day and I can proudly and honestly say that if I were “there” I would hug and kiss you both for what you do and who you are. You bring so much to the world and it is so valuable and helps so many. Thank you both. Also, please wish your parents a Very Happy Anniversary! So much good advice here. But, the trouble for me came in answering: how “patient”, how many “chances”, how long do you do “more than your part” before you finally say “ending will at least give me some hope of something better, and maybe it will be better for you too”? Knowing when working hard and staying in there has lasted into being foolish and hoping instead of living is the truly hardest part, or was for me. I can really relate to that, Berick. How long does one continue to be patient with mental and emotional abuse from a partner? Where is the line between being foolish to stay in a dead end relationship and continuing to remain committed and understanding? I can relate also, Berrick. I stayed in a relationship with a narcissist for all the wrong reasons. I separated once but he charmed me back. It was better for a while. Looking back, I was self-doubtful and figured I’d probably just find the same kind of person unless I could face my own demons and change me. That was good in some ways and true. He passed away four years ago and I am just beginning to explore a new relationship. There are the old demons in me making themselves known but I am with someone who has more self-awareness and willingness to work the relationship. I’m so glad I have this opportunity to mine for the gold in this one. You are the only one who can decide whether to stay or go. Try writing the pros and cons of staying or going. At least you will find the face of your obstacles and you may decide to seek counseling to overcome those obstacles (usually some form of fear.) Good luck and love to you. This post is excellent. These are reminders I needed in my relationship. Thanks so much for sharing this. My husband and I have been married 31 years. We have been going through some tough times lately, and I have thought about throwing in the towel. But after reading this, I have started thinking about how I could do things to start improving myself and our relationship. My husband and I have been married for almost 29 years. I observed a couple about 31 years ago when visiting a friend who shared their house. They were extraordinarily thoughtful of each other. They treated each other with the same consideration and kindness that they did me, a guest in their home. I heard them thank each other for little things. They looked at each other when talking to a group~ often smiling and showing affection. This experience of their love has influenced our relationship. We try to remember to do the same. Love is something you do. Thanks for the insight. This is helpful. That’s beautiful. I can honestly say Angel and I do our best to do the same. If each of you puts the other first, you will have a happy life together. PS: Married to Tom for 54 years and still loving him deeply. Thanks so much for these tips. They are essential and so helpful. I will like to add that for love to endure in marriage till death part the couple, none of them must accept to be The Boss. Both must see themselves as equal members of a great team who must stick together through good and bad times in order to win the battles of life all the time. Love and respect are necessary for this to happen. I love these blogs, I have just started following this year and everything you two post about makes me think about so much in life. Today is my parents 30th anniversary and i sent this to both of them via email as i found it was fitting. Thank you for keeping my head clear and the ability to keep thinking about life in general. I always find your posts to be insightful and try to apply what I learn to my relationship. This particular post is great. However, I’m struggling to balance the need to talk and the need to be silent. My girlfriend and I have weathered some tough storms in our 3 year relationship. But my frustration is that when things get really tough, she will shut down and cut off communication for days, weeks, or even months. When things are great, they can inspire a romance novel. We probably do most of the 40 rituals. But when things get tough, it’s horrific – for me. I don’t do well with silence…. Keith…I cannot speak for your girlfriend and I don’t understand the months part BUT I do understand the clamming up bit. I not a big talker anyway but when I am hurt, confused, angry, unsure, etc I don’t always know why…I have to process things and the more I get pushed for an answer, the more I can clam up. And all of these feelings can also come out the same way…and that is as crying. Also, if I do talk, I think as I talk and I don’t want/need advice, I need to think it through by talking out loud….honest sincere questions help but if someone jumps in to ‘help’, I will clam up again because I don’t feel like I am being heard. Took me a long time to realize this about myself and I know it’s frustrating for people to deal with but I’ve been deeply wounded in the past (not fair to others I know) and I think this developed as a coping mechanism many, many years ago. For what it’s worth. I can understand it for a day or two at the out side but for weeks or MONTHS ! & You have only been together a relatively short time, so much time Wasted ! A Blindingly obvious warning that there is a Critical flaw in your relationship ! To be painfully honest you have both proved there is a more suitable partner for each of you. don’t waste any more time, in hindsight life is short. The points are well documented. Three points are standing out for us. Embrace each other ‘s flaws which can be existed when the “Love” are existed. Second is listening for the purpose of understanding other than response. Third one is control. They all resonated with me but in particular #s 10, 12, 17 & 39. I have recently separated (2 months ago) from my partner of 15 years and these points were seriously lacking for about 4-5 years prior to the separation so it’s no surprise the separation was the outcome. It’s good to see where I need to improve on so I don’t make the same mistake in any future relationships. Thanks for sharing ! You’re very fortunate to have such great parents as guides. More fortunate still to have the wisdom to notice how special they are and to acknowledge it. Forgiveness and supporting one another is what has been the key to our marriage. After 15 years and many troubles and tribulations we have managed to always come out on top by remembering that our hearts and our intentions are good, and come from a place of deep love and appreciation for each other. Your right Rosie, it’s true. I can honestly say that I’ve done this for the twenty two years of our marriage and I’m proud of it. It is one way I say I love you at the begiining of every day. Her appreciative smile is the best thank you. Happy Anniversary to your parents; what a lovely achievement! These rituals are so accurate, and even though I have not been in a long marriage, I certainly wish to be some day. Having split from a man a year ago whom I was certain would be my life partner, I learned that these tips you’ve given here, were clearly not on his agenda! Thanks for sharing. Though am not married and not even ready to get married, I still found a lot of meaning in this article and have to keep it in my hand to guide me in my marriage life. What an Epic post . A great list from two who lived them. About #15, a different concept is to think of a relationship as 100% – 100%. Meaning each is always giving their all, whatever that looks like in that moment. Each is reliant on what they give, and not waiting for the other to fill them up. Yes, perhaps in reality there is a naturally occurring give and take, though with a 100-100 relationship you can find yourself never needing or expecting something, but willingly able to welcome it when it is presented. Hello! Thank you for such a beautiful post. I wondered if you could please do a similar list to improve relationships with parents? I really would like to appreciate them more and understand how they think..and it seems that you have succeeded in making that connection with your parents. Thank you! This post is very beautiful, #15 talks to me the most. Would it be okay if I translated the list to Swedish, and posted it on my blog with a link back to the original post? I’d love to translate it, but won’t do it without your permissin of course.